Black pepper is a popular spice and used in most forms of cooking and food preparation. When it comes to using both salt and pepper in cooking, most people tend to use them inappropriately. Both salt and black pepper enhance the flavors of a dish best if added during the final stages of cooking. The aroma of black pepper becomes impaired if boiled in a pot or baked in the oven for a long period of time. 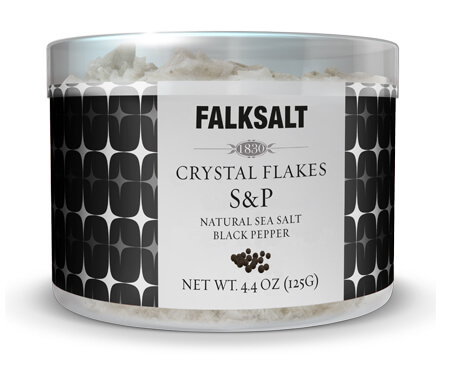 The perfect solution, then, is to sprinkle Falksalt S&P crystal flakes over the dish before the final tasting and then use it when serving. This will enhance the flavors and present them at their best! Serving Size: 1.5g, Amount Per Serving: Calories 0, Cal. From Fat 0, Total Fat 0g (0% DV), Saturated Fat 0g (0% DV), Cholesterol 0mg (0% DV), Sodium 580mg (24% DV), Total Carbohydrate 0g (0% DV), Dietary Fiber 0g, Sugars 0g, Protein 0g. Percent Daily Values (DV) are based on a 2,000 calorie diet.